Sorry for the inconvenience, at this time we are currently updating this page to better serve you. Laser Genesis is a cutting-edge treatment that can shrink your pores, improve texture, tone, and rejuvenate your appearance. Not only that, but laser treatments can help stimulate an increase in collagen production, which results in healthy, plumper, brighter-looking skin. At The Dermatology Center, we use a variety of peels to address a number of irregularities and changes in skin texture, tone, and color. Chemical peels are the perfect cosmetic treatment for patients looking for a non-invasive treatment with little to no downtime that can restore their glow and radiance. Medical grade skin care can be used to address issues in tone from mild discoloration to dull, uneven texture. At The Dermatology Center, our skin care experts will carefully choose the products that can help improve irregularities in pigmentation and brighten your complexion. The combination and number of treatments can vary due to your individual complexion needs. Some patients need a series of treatments in order to achieve optimal results. Schedule a consultation with our team to determine what combination would be right for you. Most treatments for enlarged pores and tone irregularities require little to no downtime. 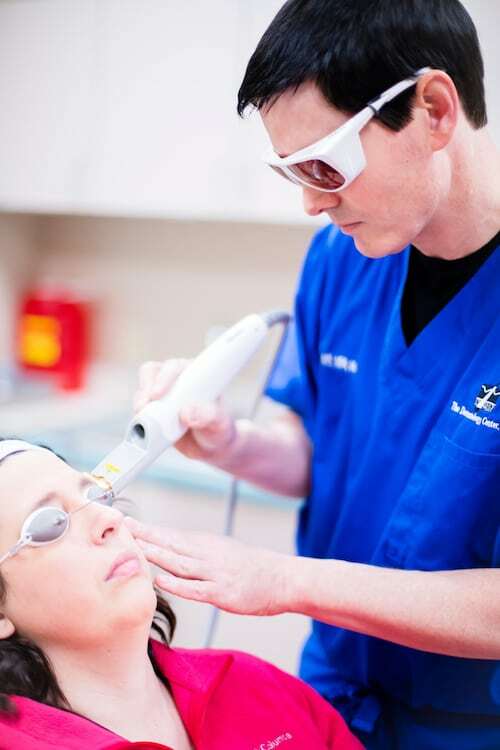 It can take several weeks for the full results to become visible after a laser treatment. People who undergo treatments to improve texture, tone, and pore size will immediately experience a brighter, smoother, tighter appearance. In the long term, people will notice improvements in fine lines and wrinkles, firmer skin, and an even texture and tone.